1. half shirt tuck. This is a great tip because it helps define your waistline. Just tuck in a small portion, you want it to look like it kinda just slipped in there. You can do this with sweaters, t-shirts, blouses or basically any top. If the first tuck doesn’t work, I just keep doing them really fast until it looks natural. 2. roll sleeves. Notice how the left sleeve looks better than the right? Long sleeves can make your arms look shorter. Even the slightest modification to the sleeve helps lengthen your arms. Or go for a 3/4 quarter length top as these are universally flattering. If you want more on sleeve length, I just found this blog article, here. 3. roll pants. Just roll them up once. You can do it with sneakers, ankle boots or sandals. Even the smallest amount of ankle elongates the leg. 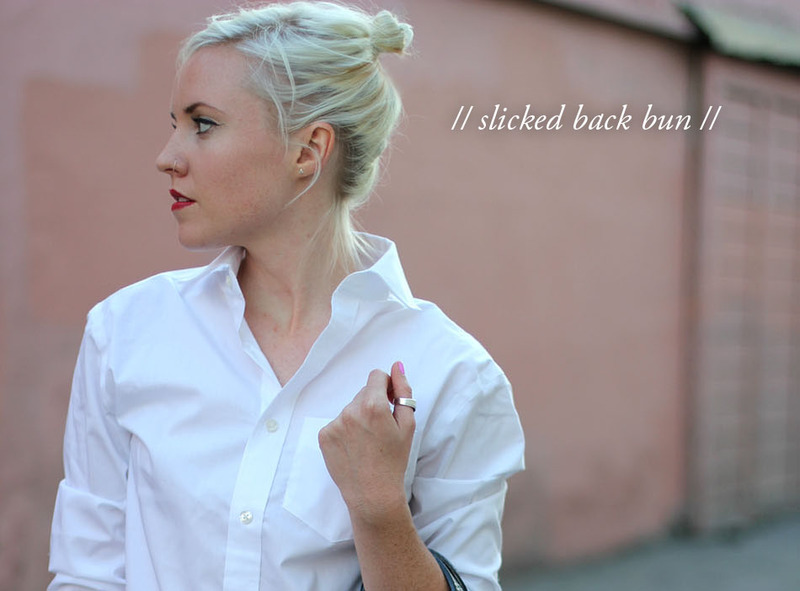 4. slicked back bun. I prefer if you’re wearing a busy necklace, large collar or earrings try a slicked back bun. It add this instant polished feel. I actually can’t do this anymore because I cut my hair but it was one of my favorite go-to accessories when I had limited time to make a look upscale. Most of these tricks involve rolling and tucking and are very simple. I often walk and around and think wow that outfit would look much more polished with just a few simple twists and tucks. These are the 4 items I do before I photograph an outfit. It looks 80% better in a matter of seconds. I hope you can pick up a few of these and use them in your everyday life. Let me know if you have any go-to styling tips when you’re in a rush. love these tips! 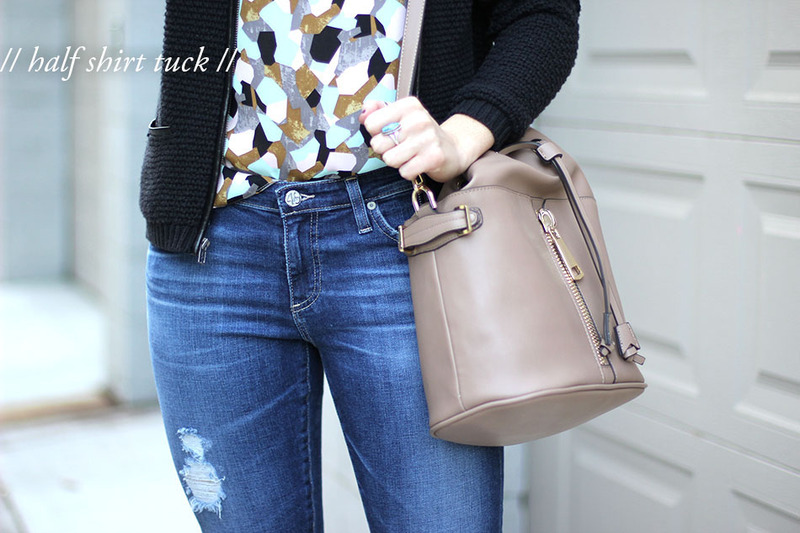 i love the front tuck! These are great tips! 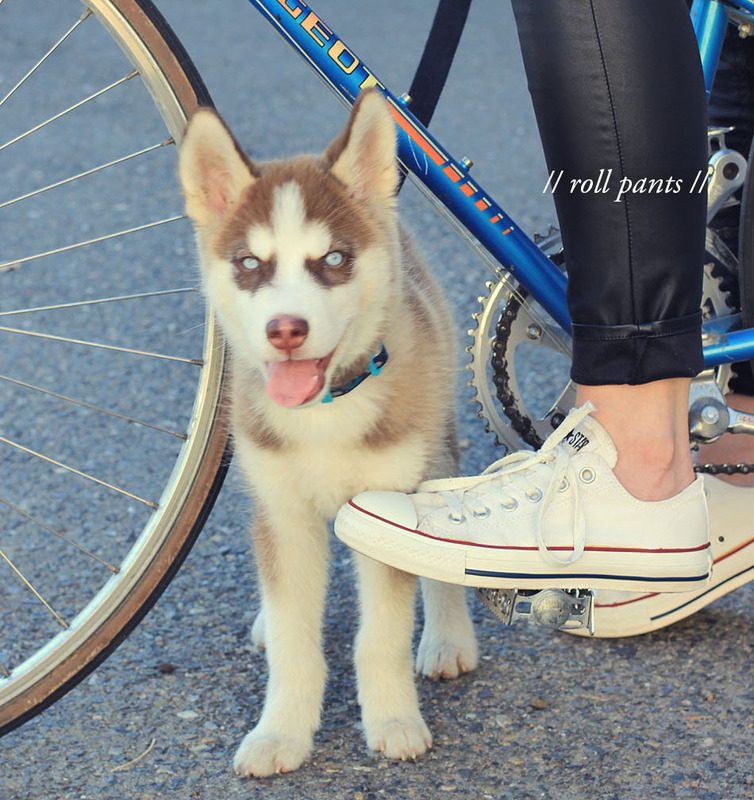 Especially the pants roll. So simple, but really makes a difference.